How Active Is Blackwater in Pakistan? Blackwater founder Eric Prince giving testimony during a House Oversight and Government Reform Committee hearing in October 2007. 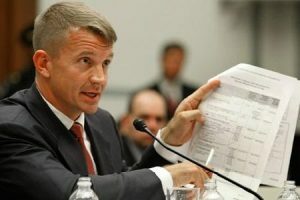 Not too long ago, a wave of concern had swept through Pakistan when the local media began screaming about Blackwater’s growing infiltration in the country and its dubious activities. The mounting pressure to expel this infamous US defense contractor put the Zardari government in a corner. It could neither ignore public pressure nor displease its benefactors in Washington. In the end, it chose to vehemently deny these stories. Pakistan’s interior minister, Rehman Malik, said publicly he would resign if Blackwater is found operating anywhere in Pakistan, as if his resignation would be a great loss for the people. These stories were also denounced as false propaganda by US officials. Responding to accusations that the US Embassy was sponsoring Blackwater, the US Ambassador, Anne Patterson, insisted that “Blackwater is not operating in Pakistan.” She claimed that Pakistani journalists were “wildly incorrect,” and blamed them for compromising the security of US personnel in Pakistan. Secretary Clinton, during her visit shortly thereafter, also dodged questions on the subject. The information that has now emerged proves the fear of the Pakistanis to be correct. Not only has Blackwater been working in Pakistan, but it grows stronger by the day. Who would know about Blackwater’s presence or absence in Pakistan better than the owner of Blackwater himself? The reclusive owner of the infamous Blackwater empire, Eric Prince, was caught on audio tape by The Nation, a New York based magazine, acknowledging that his organization does work in Pakistan. He said this in a speech earlier this year at the University of Michigan. Could Prince have been clearer on this issue? One wonders how Pakistan’s interior minister or Ambassador Patterson could prove him wrong. One wonders also if it is time for the interior minister to abide by his promise to resign and Ambassador Anne Patterson to apologize to the people of Pakistan for making false statements. The reality is that the stories were true and hence have refused to go away. The people of Pakistan neither took the US Ambassador seriously, given their distrust for the US and its self-serving policies, nor gave any credence to denials of their own government, knowing full well where these came from. They are convinced that this notorious private contractor is spreading its tentacles in Pakistan for undercover operations on behalf of the US agencies. There is a growing fear that Pakistan could soon witness Iraq and Afghanistan-like situations at the hands of Blackwater agents. Blackwater, described as the most notorious mercenary army, which recently underwent rebranding as ‘Xe Services LLC’ in response to legal complications owing to its unlawful activities, has played a crucial role in the American wars in Iraq, Afghanistan and now Pakistan. From the beginning of Bush’s ‘war on terror’ it has undertaken secret and illegal operations that CIA, Pentagon or State Department could not themselves undertake due to Congressional restrictions. Blackwater earns multimillion revolving contracts because it enables the U.S. to circumvent Congressional restrictions and achieve their goals without deploying uniformed soldiers in these countries due to political sensitivities. As Eric Prince put it: “…the private sector can operate there with a very, very small, very light footprint”. And on top of it, there was no fear of accountability. Blackwater operatives are usually deployed under cover, for instance as aid workers. In Pakistan, as in other countries, Blackwater is honeycombed with CIA, US Joint Special Operations Command (JSOC), Pentagon and State Department in conducting a variety of operations. Additionally, it is also perceived by the people and the media to be involved in supporting the agenda of destroying the fabric of Pakistan’s nationhood through suicide bombings, fanning religious extremism and supporting nationalist and separatist movements, using Pakistanis whose loyalties are up for sale. He goes on to say: “the Blackwater operatives also assist in gathering intelligence and help direct a secret US military drone bombing campaign that runs parallel to the well-documented CIA predator strikes, according to a well-placed source within the US military intelligence apparatus”. Quoting a military intelligence source, he says: “the Blackwater team in Karachi also helps plan missions for JSOC inside Uzbekistan against the Islamic Movement of Uzbekistan”. Jeremy Scahill also reports on the Pentagon having contracted a Pakistani company owned by influential Pakistanis with close links to Eric Prince, for ground transportation of large Afghanistan-bound arms shipments from Port Qasim in Karachi. Interestingly, security of the consignments has been entrusted to Blackwater operatives working under disguise. With the Zardari government cornered in the wake of the Blackwater scandal last year, the Americans found to their dislike the Pakistan foreign office dragging its feet over issuance of unlimited number of visas, unlike their past practice. This time the foreign office refused issuance of visas to an unusually large batch of 300 non-diplomatic staff listed as ‘defense officials’ without first examining their purpose of entry and antecedents. The foreign office was also reluctant to meet US demand of granting diplomatic visas to them and allowing privileges like exemption of baggage from customs inspections. Not only was this against the rules but raised suspicions about nature of the cargo these personnel intended bringing into Pakistan. Washington justified these unusually large numbers saying these personnel were being assigned to process the aid that was being given to Pakistan. “….We just need more visas to put the people in place to help work with Pakistan and to make progress on economic issues, security issues, and agricultural issues,” said State Department spokesman P.J. Crowley. Then to prove its point, it held up disbursement of the promised economic assistance. It went further and also held up routine visas for Pakistani diplomats on transfer to Washington. Pakistan’s foreign office eventually capitulated to Washington’s demands, the crunch apparently coming after the visit of Secretary Clinton and Ambassador Holbrooke to Islamabad, who promised to ‘clear ways for assistance projects’ in exchange for the visas. The insistence by the US State Department for visas for personnel who did not initially qualify in the judgment of Pakistan’s foreign office makes these personnel appear dubious. They appear even more dubious because reportedly the information given on their visa applications was found incomplete and evasive. This underscored the perception that under the cover of diplomatic visas, more employees of American ‘private contractors’ were being smuggled into Pakistan. Reportedly, about 180 US Cobra operatives, including Xe personnel, have recently been secretly positioned in Islamabad, Lahore, Karachi, and Quetta, and more are expected to join them. The US intelligence agencies think that a number of Al-Qaeda and Taliban leaders are hiding in Karachi, Quetta and Peshawar. There are also reports that about 650 US nationals, including 200 US Marines, are either on their way or have arrived already on multiple entry visas granted by the Pakistan Embassy in Washington under special authority given to Pakistan’s Ambassador Haqqani by President Zardari. There was no need for any special authority if the US visa requests qualified under the existing rules. Clearly, the rules had to be bent. Amid fears that the CIA, JSOC, Pentagon and the State Department would not hesitate to pass off their private contractors’ operatives as ‘defense officials’, the bending of visa rules and giving a carte blanche to the US Embassy is a grave folly. If anything, this is an indicator of how far the sovereignty and the security of the state are being compromised by the Zardari government for the sake of economic assistance that the Americans cannot really stop indefinitely. Why does President Zardari forget that the Americans need Pakistan badly and giving economic assistance to Pakistan is in America’s own interest, as much as taking it is in the interest of Pakistan?